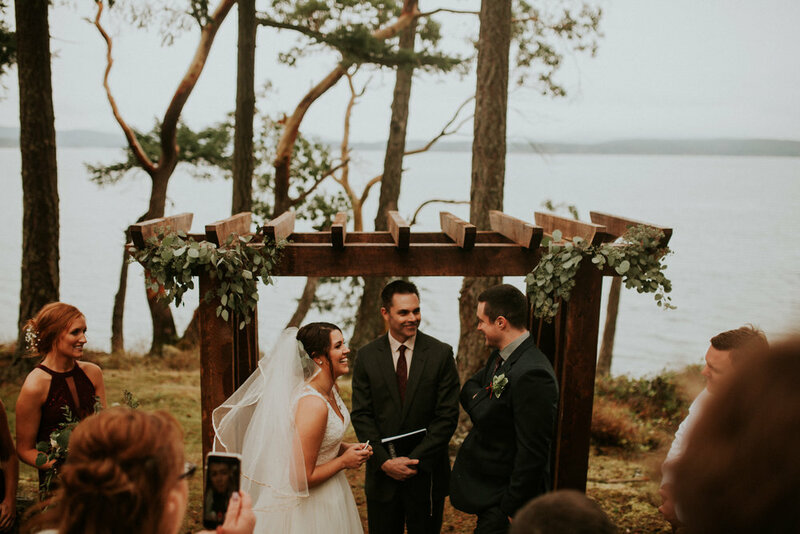 These cute humans eloped at Friday Harbor by the shore of the sound. The waves were crashing on the cliffs behind us, and all of the bridesmaids had visible goosebumps from the wind. Everyone crowded around so we could hear the sweet vows that Ashley and Chad exchanged. Tears were being wiped from everyone's eyes, as they placed rings on each other's fingers. Ashley + Chad met at work. He had a crush on her, and she didn't know that he existed. He finally got up the nerve to ask her out, and she said yes. He proposed to her at a waterfall, and she was shocked by how casually he asked her if she wanted the ring she had just pulled out of his bag. They chose to elope with their closest friends and family on an island in the San Juans. The day started with a blustery snow storm, but the rain stopped before Chad and Ashley had their first look as bride and groom.